Advocates of alternative health attribute all sorts of fantastical properties to the human body. The body supposedly “knows” how to live a long healthy life; the body is supposedly “designed” to work perfectly. The tenets of natural childbirth philosophy also invoke these fantastical properties. The body “knows” how to give birth; a woman’s body is “designed” to give birth. On their face these claims are obviously false. The body doesn’t “know” anything and the body is certainly not designed by anyone. It is the product of millions of years of evolution with the many trade offs that evolution requires. At a deeper level, claims about what the body “knows” or is “designed” to do reflect a fundamental misunderstanding of evolution. There is an unstated belief that the human body reflects precision craftsmanship, but evolution is not a precision craftsman. Indeed it has much more in common with a football coach than an individual who works according to a predetermined template. I became a football fan when one of my sons played PeeWee Football. I hated the experience; I was always worried that my son would get hurt, but I learned the game and loved it. It took me a while to understand the different types of players and the different types of plays. But there was one thing I realized from the very beginning: every football play is designed so that if executed properly, it results in a touchdown. So every play is literally designed to result in a touchdown but very few actually do. Why? One problem is execution. The quarterback fumbles the hand off to the receiver; the receiver slips while running toward the goal line; a lineman throws an illegal block and the play is called back. All of these represent mistakes. Someone fails to do what he is supposed to do and the play never develops as it was designed to do. It’s not surprising then that it doesn’t result in a touchdown. Illness and accident are the medical equivalent of botched plays. The individual would have gone on to live a long and healthy life had he avoided the polio virus, had he not fallen and broken his leg, had he never started smoking. There was nothing intrinsically wrong with the body. The problem arose outside and then affected the body. But most plays in a football game are properly executed and yet many don’t result in touchdowns, either. If every play is designed to end in a touchdown, why are touchdowns so rare? The hand off is made properly, the linemen throw their assigned blocks, the crease opens up, yet the receiver never gets to the end zone. What went wrong? Usually what “goes wrong” is a big guy from the opposing team getting in the way and tackling the receiver far from the goal line. 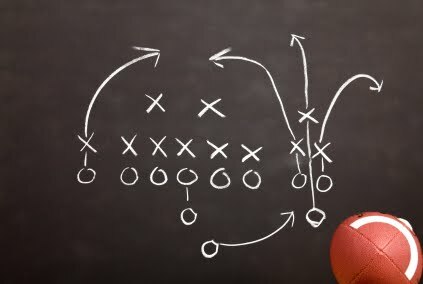 The play is “designed” to the extent that the team members know exactly what they should do, and indeed, if there was no opposing team on the field, every play would end in a touchdown. But there is an opposing team and the play can never account for what they will do. Similarly evolution means that while every person is supposed to live out his natural lifespan (a touchdown), the environment can never be predicted in advance. The environment is the opposing team and, as in football, it can change at every play. What confers fitness in one environment, may be a fatal weakness in another. In football, an individual team member can adjust his role in response to a particular player on the defense, while the rest of the play takes place as designed. That option is not possible in human evolution. The woman with the slightly narrower pelvis that conferred on her the speed to escape animal attackers cannot modify that pelvis at the time of birth. The narrow pelvic dimensions that allowed her to be fleet of foot and escape the tiger that killed her sister may condemn her to death during childbirth when the baby cannot fit through that pelvis. If individuals did not have to contend with environmental factors they would live out their natural life spans, every women would give birth successfully. But that’s the equivalent of no opposing side on the field; it never happens. Therefore, the claim that people are “designed” to live until old age or that women are “designed” to give birth is about as meaningful as the fact that every football play is designed to end in touchdown. The design does not guarantee success. In football, most plays fail when they come up against the reality of the opposing team. In evolution, many individuals fail (die) when they come up against the reality of the environment. In football, one side wins when it gets more points than the other side, which is doing its best to keep it from getting any points at all. In evolution, a species wins (survives) when enough of its members live to reproduce successfully despite the problems posed by the environment and the additional difficulties posed by the fact that what is adaptive in one environment can be maladaptive in another. Claiming that people are “designed” to live out their natural lifespans or that women are “designed to give birth and insisting that things go wrong rarely if ever is like claiming that every football play is designed to end in a touchdown and things rarely if ever go wrong on the field. The play may have been designed perfectly, but when the 350 pound lineman knocks the receiver to the ground, the design is meaningless. Similarly, a woman may be “designed” to give birth, but when the baby doesn’t fit, or her blood pressure rises dangerously, or the placenta does not provide adequate blood flow to the baby, the “design” is meaningless.